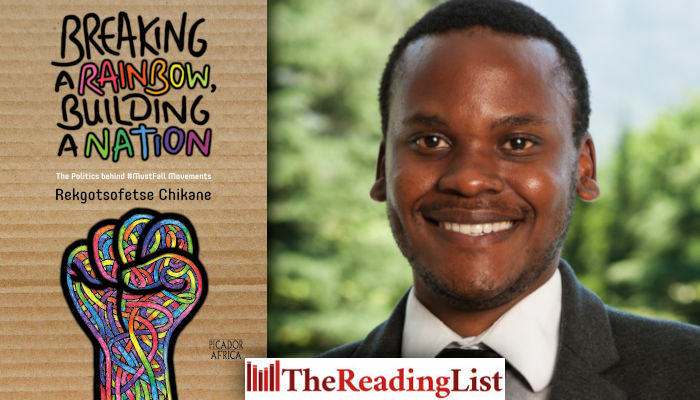 Rekgotsofetse Chikane, youth activist and author of Breaking a Rainbow, Building a Nation, spoke to The Reading List about the nature of student politics in the country before, during and after the emergence of #FeesMustFall. The Reading List: You have said that you wrote this book because ‘if we don’t write these stories ourselves, someone else will’. What pragmatic advice would you have to other young student leaders thinking of writing a book? Rekgotsofetse Chikane: It’s okay to wonder how you are ever going to start writing a book, never mind finishing it. It’s hard, but rewarding once things click into gear. My suggestion would be to break the book down chapter by chapter, and section by section and try to be as consistent as possible with your writing. However, what is most important is finding a way to write that is comfortable for you. Do that and you will be well on your way to writing a book. The Reading List: On the first page of the book you speak about how your father, Frank Chikane, was your ‘political school’ growing up, but add that you are ‘at odds’ with him over the idea of the ‘rainbow nation’. Has your father read your book? What does he think of it? Rekgotsofetse Chikane: My dad actually delayed reading the book for the longest time. I only heard his feedback earlier this year. I think he is proud that I wrote the book and appreciates its ideas. He obviously disagrees with some of my views, but in a way that encourages even more debate at the dinner table. I think his biggest concern is whether I will outsell his book, which obviously I won’t. But it’s nice to keep him on his toes. The Reading List: The book has as its fulcrum the #RhodesMustFall and #FeesMustFall movements, but you take a very wide view of university politics, often going back to the early 2000s to elucidate a point. Did the book involve a lot of research? Why did you decide to take this approach? Rekgotsofetse Chikane: A fair bit of research was involved. Mostly because I wanted to avoid having the chapters sound as if they were purely coming from my vantage point. That was important to me. Ensuring that people understand that although this is a book that I wrote, I managed to ensure that a plurality of voices and opinions still made an appearance. I wanted to go back as far as I reasonably could because I wanted to show that the events of 2015 didn’t take place in a vacuum, but rather were a build-up of various tensions that were growing across the higher education system of South Africa. If one believes that #FeesMustFall for instance is a protest focused on fees and/or finance related issues on campus, then #FeesMustFall has been present in our society since the late ’90s. The Reading List: In the book, you write that a ‘lack of class introspection would become, either directly or indirectly, the primary driver of the internal conflict that would play out in #FeesMustFall’. I think this idea can be linked with how protests at different campuses – UJ vs Wits, for example – are covered, or not covered, in the media. How do you think class perception affected the #FMF movement? Rekgotsofetse Chikane: The most obvious answer that is often bandied around is that Wits and UCT stole the media limelight during the protest. A fair observation and one that should constantly be interrogated. But if we step back from the class perception issue, I think the bigger concern is the media’s ability to alter the sensibilities of our society with regards to injustice. Why should the same injustice that takes place at Wits mean more than if it takes place at Walter Sisulu University? This perception issue is often class-blind and that is what worries me the most. Now I will probably receive a bit of criticism of saying that, but I would probably respond by saying how is it possible that an entire country has internalised and normalised that South Africa has a service delivery related protest almost every single day? Just think about that. We live in a nation that is constantly at ‘war’ with itself but society, across class, has been mad blind to it. It begs the question, what other injustices in South Africa take place every day that we currently don’t know about? The Reading List: You see #RhodesMustFall and #FeesMustFall as the first examples of young South Africans, post democracy, saying that there is something fundamentally wrong with our society. Perhaps it’s a reductive question, but do you see the #MustFall moment, as it happened over 2015 and 2016, as a success? Rekgotsofetse Chikane: Yes. Not because Rhodes or Fees fell, but because my generation successfully hosted the most well-attended coming-of-age party that this country has seen since the end of apartheid. We successfully managed to highlight to the entire country that, while they might have accepted the status quo of high youth unemployment, systemic poverty and the systematic maintenance of income inequality in our nation, we haven’t. And we are willing to forcefully change our society if the need arises. We are a success because we now no longer want to be the wretched of the earth. The Reading List: There is no doubt that the intentions of students during #RhodesMustFall and #FeesMustFall started out nobly, but the movement became, as you put it, ‘violent and dissociative’. Do you think anything could have been done differently to move the protest in a more productive direction? Rekgotsofetse Chikane: I have thought about this question for quite some time and my current take on it might just surprise you. Why do we assume that with less violence, the protest might have been somehow more effective? As if the violence that took place was more of a distraction to the true work that needed to be done rather than the essential element to our cause. I wish to believe that the violence that was perpetrated was necessary in order to achieve the gains that we did. I don’t mean to sound as if I am minimising the negative effects of violence, or worse yet, glorifying violence. But I do wish to highlight that the erasure of violence from the protest does not necessarily entail increased productivity with regards to our efforts. Furthermore, to talk about violence in the protest as if it existed with vacuum, hides all the fallacies sprinkled over such a view. Fallacies that are quickly removed when violence is contextualised. While students and Vice-Chancellors might disagree on a variety of issues, we will most likely agree that the often antagonistic role that the police played within the protest became the largest spark of violence. That being said, I believe the amount of violence that did take place, was the requisite amount of violence required. The Reading List: As someone deeply involved in the protest, do you think there were any valuable lessons learnt about protest action during this time? Do you have any advice for future student protesters? Rekgotsofetse Chikane: There is no such thing as an apathetic student, as a student leader, it is your responsibility to determine how to best maximise the political power within students.